My ePortfolio has been up and running for almost a year and a half now. I am surprised by the amount of traffic and diversity of viewers. 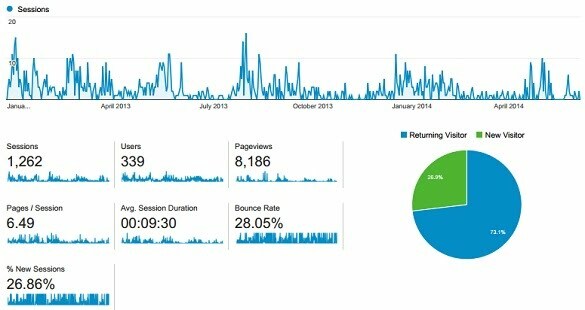 Collecting site traffic was a feature I implemented a few days after initial creation. I felt it was important to get an idea of how viewers were navigating this site, so that I could improve accessibility. General statistical information can be accessed through Welcome > Site Stats. My ePortfolio has had a total of 339 unique visitors and 1,262 visits from 164 cities and 32 countries as of June 7, 2014. I am glad to see that my ePortfolio has attracted an international audience. Visitors come as far as France, Brazil, India, Norway, Spain, Malaysia, Netherlands, Germany, Hong Kong, Greece, Israel, Egypt, Sweden (just to name a few). The above report shows how many viewer visit each day (sessions), how many overall unique viewers (users), how many overall pages viewed (pageviews), on average how many pages are viewed (pages/session), on average long a viewer is on this site (avg. session duration), what percentage of single page sessions (bounce rate), and what percentage are new viewers.